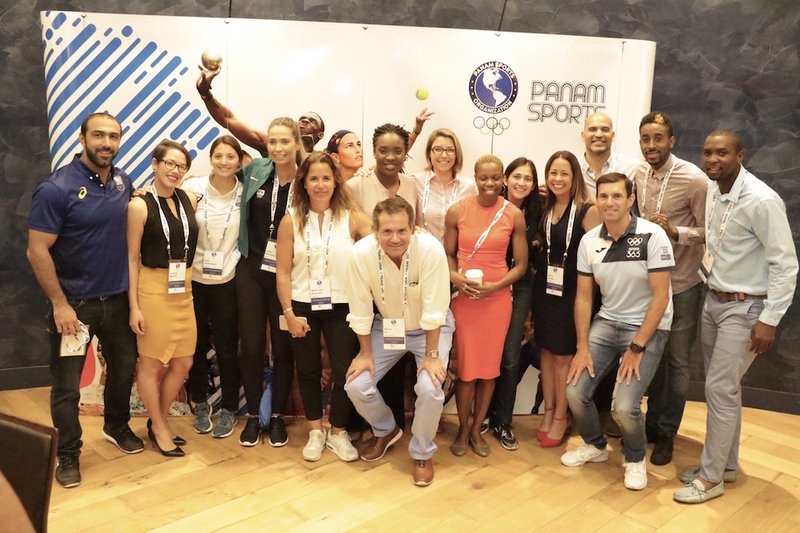 The second Panam Sports Athlete Forum in Miami brought together more than 70 athletes to collaborate and commit to make the athlete voice louder throughout the Olympic Committees of the Americas. Athletes collaborated over three days to compile seven recommendations that will be sent to the Panam Sports Executive Committee for review in order to ensure the needs of athletes in the Americas are the organization’s core priority. MIAMI, USA (October 29, 2018) – The largest and most engaging Athlete Forum ever held by Panam Sports, with support and funding from Olympic Solidarity, gave athlete leaders of the Americas the opportunity to shape the future of the continental organization and its premier event, the Pan American Games. 3. Panam Sports Athlete Commission and the Americas’ Athlete Commissions should work with Panam Sports and their respective NOCs to encourage them to adopt the Athletes’ Rights and Responsibilities Declaration at both the continental and national levels. “I’m really proud of the recommendations that came out of the Forum. We have seven really strong statements to our institutions that govern athletes here in the Americas. I’m proud that Panam Sports was here, our President Neven Ilic and Secretary General Ivar Sisniega, not only to listen and to speak directly with the athletes, but also to support the recommendations we made and they are excited about now going back and trying to implement them,” said Panam Sports Athlete Commission President, Alexandra Orlando. These recommendations were made possible due to the unprecedented amount of participation by the more than 70 athletes who attended the Forum. Nearly all of the athletes were active throughout each segment, raising thoughtful questions and filling the room with lively debate during the breakout group sessions. Great contributions were also made by Panam Sports Athlete Commission members Carlos Santiago, Aliann Pompey and Andrea Estrada who led many of the sessions and discussions. In fact, the level of participation was so high that nearly all of the planned sessions and topics went over the allotted time. Panam Sports was more than happy to extend the program to ensure as many athletes as possible could share their ideas, concerns or questions with the other dedicated athletes at the Forum. “The Forum was incredible, spectacular. We touched on many important topics, several of which were also discussed two years ago, but now we’ve seen the conclusions and the fruits of that labor. Now there are Athlete Commissions that are more structured, more countries that have formed commissions and Panam Sports is very interested to put forth great efforts to create more with a President committed to the relationship between the NOCs and their athletes, which I believe is vital in the Olympic Movement of today,” said Paulo Cesar Del Villar, an Olympic hurdler from Colombia. But the athletes were not the only ones who helped create an unforgettable forum. Panam Sports President Neven Ilic opened the Athlete Forum, expressing his commitment to the athletes of the Americas and why they will remain as the organization’s most important stakeholders. Panam Sports Secretary General Ivar Sisniega presented the Strategic Plan which emphasizes athletes as the core of the organization, while also listening to the needs of athletes and agreeing to share the recommendations of the Forum with all the NOCs throughout the continent. An Olympian himself, Sisniega also offered advice about the transition from athlete to the work force and the innumerable opportunities that exist after a competitive career has ended. Danka Bartekova, the Vice Chair of the IOC Athletes’ Commission, as well as IPC Athlete Council member Monica Bascio, World Olympians Association Secretary General Anthony Ledgard, WADA Athlete Committee member Lauryn Williams, Americas Paralympic Committee Athlete representative Ileana Rodriguez, Chair of the ANOCA Athletes’ Commission Amadou Dia Ba and ONOC Athletes’ Commission representative Anolyn Lulu also shared valuable information and led discussions about some of the biggest challenges facing athletes today. Detailed presentations from IOC representatives touched on topics such as the Athletes’ Rights and Responsibilities Declaration – which the Panam Sports Athlete Forum has unanimously supported – the Athlete 365 platform, the burgeoning Athlete Career Program as well as the Prevention of Competition Manipulation and Match Fixing and the Prevention of Harassment and Abuse in Sport. Sessions on anti-doping education by the World Anti-Doping Agency and information about the Independent Testing Agency were valuable to the athletes in order to learn about the importance of clean sport. Athletes also received a special presentation by Heidi Pellerano of the Wasserman Group to learn how to better market themselves as active athletes or legends, including best practices to build their own personal brand. The Pan American Sports Organization (Panam Sports) is the leader of sport and the Olympic Movement in the Americas. We propel the development of sport and support our 41 member National Olympic Committees to inspire more participation in international competitions as well as participation of the youth to prepare the generation to come in our region. Panam Sports works closely with athletes, National Olympic Committees (NOC), Organizing Committees of all regional games, Pan American Sport Confederations, International Federations (IF) and the International Olympic Committee (IOC) to secure the success and celebration of our main event, the Pan American Games.